Roughly 15 years ago, I spent six challenging, wonderful years (1997-2002) launching and directing a national grassroots campaign, The Pet Overpopulation STAMP OUT™. 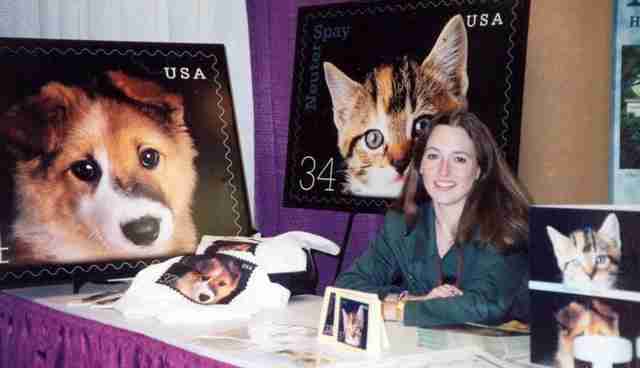 The campaign's goal, persuading the US Postal Service to issue a commemorative stamp advocating the neutering and spaying of companion animals, was achieved in 2002 thanks to a successful write-in campaign reflecting widespread citizen support. Prior to "Neuter/Spay," animals on US stamps were mostly decorative, either cute, cuddly companions of home and hearth or exotic "Wild Kingdom" fare. The Citizens' Stamp Advisory Committee, the body of distinguished private citizens appointed by the Postmaster General to evaluate and approve stamp proposals, wouldn't accept email correspondence. The USPS was in the paid postage biz, after all. If you wanted your letter to count toward a write-in campaign such as STAMP OUT, you'd gosh darned better put a stamp on it. The US Postal Service takes its stamps very seriously; prior to any public announcement the program for each year is kept super secret -- and carefully curated. There are many criteria for submitting a stamp subject, and precious few grassroots proposals ever see the light of day. If I wanted "Neuter/Spay" to beat the odds, I couldn't only think like an "animal welfare" advocate. I would need to think like a philatelist. 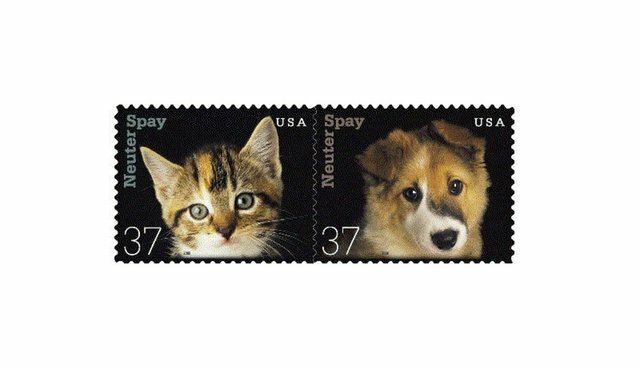 In the course of our six year campaign, more than 200,000 Americans wrote to Postal Headquarters urging that "Neuter/Spay" be issued as a commemorative stamp. Celebrities such as Betty White, Bernadette Peters, Bob Barker and Mary Tyler Moore added their voices to those of veterinarians, animal advocates, animal lovers, responsible breeders, philatelists, and politicians at the federal and state levels from both parties. The final stamps depicted close-up photographs of a former shelter puppy and kitten. But the stamps were meant to be practical as well as inspirational. Included on each stamp sheet was the website and toll-free English/Spanish telephone hotline linked to a national directory of low- and no-cost spay/neuter resources. With approval won, our focus shifted to promotion. In response to a call I made to game show host, Bob Barker's talent manager, "Neuter/Spay" was unveiled before a live studio audience on his nationally televised "The Price is Right." The First Day of Issue Ceremony (literally the day a commemorative stamp goes on sale nationwide) took place in September 2002 in Denver at the American Humane Association's national conference, the program emceed by motion picture director and writer, Joe Camp and his most recent "Benji" canine protégée. (Yes, that Benji was a "girl."). All the hard work and follow-through paid off. "Neuter/Spay" became a postal bestseller, selling out its entire 250,000 print run, sales that were, at the time, second only to the Elvis Stamp among postal commemoratives. The stamps' issuance might not have single-handedly put an end to unwanted litters, but it was an important victory for those of us struggling to bring animal welfare into the public eye as a mainstream national issue. Its spectacular sales laid the foundation for approval of later commemoratives with humane educational themes, notably the "Adopt a Shelter Pet" Stamps championed by celebrity talk show host and comedienne Ellen DeGeneres, released April 2010. In my STAMP OUT days, I was fond of saying that human beings have three choices. We can choose to do good; we can do choose to do ill -- or we can choose to do nothing. Most of us all fall into the latter camp. A crazy economy, family and career responsibilities, health issues -- all can keep our proverbial plates so full they seem to be in ever present danger of spilling over. Not long ago I was admiring the rescue cats and kittens for adoption at my local Petco when a volunteer from the rescue group walked up to me. In his forties, he had a broad, dare I say dazzling smile -- so dazzling I soon stopped noticing his broken and missing front teeth. "I understand what they're going though," he said, jerking his chin toward the queue of cages from which several hopeful little faces peered out. "Until a few years ago, I was homeless, too." This man had been helping animals all his life. Homeless, he nonetheless took it upon himself to alert local police to a mother cat and kittens trapped in a boarded up building in a Manhattan neighborhood where he was sleeping on the streets. Without access to food and water, the little feline family wouldn't last much longer. But because of one man's compassionate persistence, those animals didn't starve or thirst to death. Instead they were rescued, vetted, and found foster homes with the very rescue group for which this gentleman, no longer homeless, now volunteers. No, we can't save them all, but if we can work to make the world a brighter place one person -- and one animal -- at a time, we haven't only altered our corner of it. We've created a brighter Universe and future for us all. Hope Tarr is the co-author of the forthcoming novel, "Honey," which addresses the issue of Intimate Partner Violence (IPV) through the heroine, Honey Gladwell, and her adopted rescue kitten. The book concludes with an informational Author's Note of online resources where IPV victims can go for help, including national directories of shelters and rescue groups that will accept pets in a domestic crisis situation.